Throughout history, women have tended to keep close to home, and therefore have been able to gain a wide variety of knowledge about plants and their medicinal and aesthetic values. 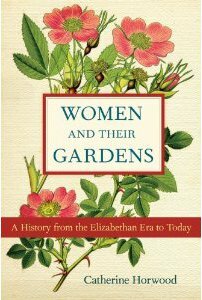 In the lovely book Women and their Gardens: A History from the Elizabethan Era to Today by Catherine Horwood, we learn about female gardeners and how they gained their expertise. In addition, the book gives wonderful information about how flowers and plants have been used by women for various purposes throughout the years, including decoration of home and self, medicinal purposes, and artistic objects. The book is divided into sections covering various aspects of gardening, and the individual chapters tend to run from earliest times to more modern examples of females excelling in the garden. 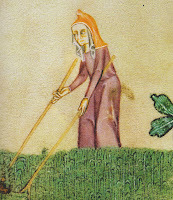 It is fascinating (and sometimes maddening) to read of how many women became involved in gardening, whether it was through being banished to the country by harsh spouses, needing to earn an income, or, occasionally, because they had the time and means to indulge their passions. It was interesting to read how some of these early enthusiasts, eager to expand their inventories, gathered plants and seed from various far-flung countries. Given all the current concern with inadvertently introducing pests and diseases with agricultural products, I had to wonder if any non-native species might have hitched a ride on some of these early specimens! The tenacity of the women who chose gardening as a profession is amazing. Although there were some professional training schools for women beginning in 1891, female graduates were still frequently not considered for the more skilled positions. Even if they were able to get good gardening jobs, if they married, they were required to stop working immediately. It was disheartening to read about highly skilled women who studied their craft for many years, earned credentials, and were only able to work professionally for a few years before being forced out. It was also amusing to read about the strict guidelines on clothing (both summer and winter) that the female students were required to wear at some of these institutions of higher learning. The author points out that there were "regulation knickers" but that rubber boots and gardening gloves were optional. At least the schools had their priorities in order! One of my favorite quotes in the book concerned the new fashion of women adorning themselves with flowers. Hannah More wrote in 1770 that at a party she had observed "women with on their head, an acre and a half of shrubbery, besides slopes, grass plots, tulip beds, clumps of peonies, kitchen gardens and greenhouses." Shows how times don't really change all that much, when you consider our own dear Duchess of Cornwall wearing what appears to be a sheaf of wheat on her head (apparently on purpose). Another amusing story concerned Miss Chrystabel Procter who took a job as a gardener at Griton College at Cambridge. The staff of the college regarded the flowers as free room decorations and took what they wanted when they wanted. Ms. Procter tried to put a stop to this practice by instituting rules as to when and where flowers could be taken, but alas, her gardens were always "under attack from lurking flower arrangers." I can just picture them skulking around, hiding in shadows, patiently waiting for an opportunity to pounce on a particularly showy bloom! The book is beautifully illustrated with black and white and color photos. There are also plenty of notes in the back for further reading, as well as lists of horticultural medal winners and notable gardens by women. All in all, this book is a fascinating look at how women helped to shape the beautiful gardens that are so identified with the green and pleasant land that is England. Disclaimer: I received a review copy of Women and Their Gardens from Independent Publishers Group.